The Zoo Park Bounce House and Ball Pit features a unique animal zoo theme, with animal graphics both inside and out, The bouncer has two slides, a bounce area, ball pit, and a ball hoop.The second slide leads from the Bounce area to the ball pit, giving the little ones with plenty of activities to stay busy for hours of fun. Perfect for three kids at a time with a 300 lbs weight limit. Inflated dimensions are 10.5' x 9.8' x 6'H and weighs 48lbs. 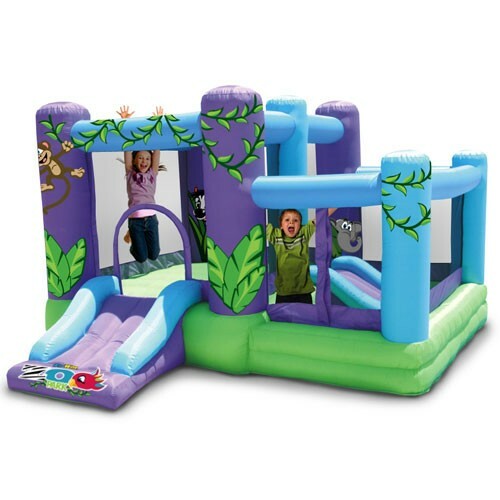 This inflatable bouncer has an inside bounce area of 60” x 57“. ;For residential use only! Any commercial or public use voids warranty.